Most of the faithful don’t know about this feast. Apart from priests and a few other Christians who are more closely involved with the Church, most don’t even know of its existence. Few go to church on this day and most of them don’t even suspect that the Wednesday after the Sunday of the Paralytic is celebrated by the Church as a Great Feast of the Lord, the Feast of Mid-Pentecost. And yet this feast was once a major feast of the Great Church of Constantinople and crowds of people attended it. You only have to open On the Administration of the Empire by Constantine Porphyrogennetos to see the official rite for the celebration of the feast, as it was observed on Mid-Pentecost in 903 A.D. in the Church of Saint Mokios, in Constantinople, that is until the day when an attempt was made on the life of the emperor, Leo the Wise (on 11 May, 903). 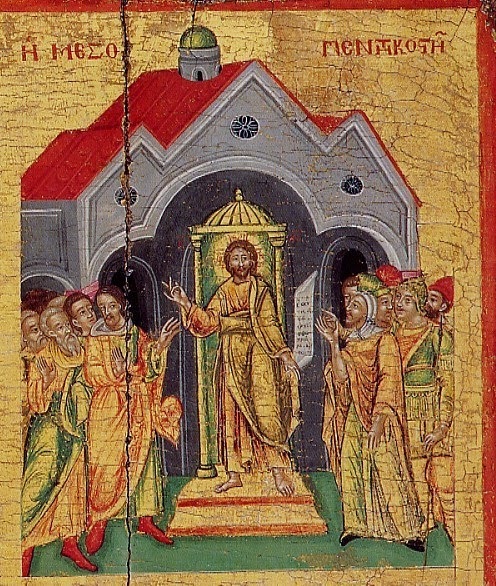 It takes up page upon page and, in the familiar, tortuous Byzantine terminology, declaring that, on the morning of the feast, the emperor in his official royal robes and with his entourage, was to leave the palace to head for the Church of Saint Mokios, where the Divine Liturgy would be celebrated. Soon a procession arrived, with the patriarch at the head, and emperor and patriarch entered the church together. The Liturgy was celebrated with all the customary Byzantine splendor. After this, the emperor hosted a breakfast meal, which the patriarch also attended. And then the emperor, accompanied by the shouts of the populace "May God guide your reign for many good years" made his way back the palace, with a number of intermediate stops. And in our liturgical books today, in the Pentecostarion, you can see traces of this ancient splendor. It is presented as a Great Feast of the Lord, with its special hymns and its double canons, works of the great hymnographers Theophanes and Andrew of Crete, with its readings and its influence on the preceding and succeeding Sundays, and with the extended period of eight days of feasting, as is the rule for all the Great Feasts in the Church’s year. But what was the theme for this particular feast? Not any event in the Gospel histories, certainly. The theme is purely festal and theoretical. The Wednesday of Mid-Pentecost is the 25th day after Easter and the 25th before Pentecost. It marks the mid-way point of the fifty festal days after Easter. In other words, it is a stage, an intersection. To put it differently, without having its own theme, it links the themes of Easter, on the one hand, and the descent of the Holy Spirit on the other, while heralding the glory of the Lord’s Ascension, which will take place two weeks later. The Gospel reading which was chosen for this day is also pertinent. In the middle of the feast of the Jewish Passover Jesus went up into the temple to teach. His teaching made a great impression, but also provoked discord between Himself and the people and the teachers. Was Jesus the Messiah or wasn’t He? Was His teaching from God or not? Now a new aspect had been added: Jesus was teaching. Although He never was educated, He had command of the whole fullness of wisdom, since He is the Wisdom of God Who made the world. It is precisely this dialogue that informs a large portion of the hymnography of the feast. He Who is teaching in the temple, in the midst of the teachers of the Jewish people, in the middle of the feast, is Christ the Messiah, the Word of God. He Who is condemned by the so-called sages of the people is the Wisdom of God. A few lines further in the Gospel according to Saint John, immediately after the passage containing the dialogue between Christ and the Jews, "in the middle of the feast", comes another, similar dialogue "on the last great day of the feast", that is at Pentecost. This begins with the Lord saying: "If anyone is thirsty, let them come to Me and drink. Those who believe in Me, as the Scriptures say, shall have rivers of living water flowing from their bellies." And the Evangelist comments: "Now he said this about the Spirit, Who believers in Him were to receive." It matters not that these words of the Lord were not spoken at Mid-Pentecost, but a few days later. Through poetic license, they are put into the mouth of the Lord at His speech at Mid-Pentecost. In any case, they are very well suited to the theme of the feast. A more graphic image could not have been found to demonstrate the teaching work of Christ. The teachings of the Lord came to the thirsting human race like living water, like a river of grace cooling the face of the earth. Christ is the fount of grace "of the water that will gush up to eternal life," which quenches and waters people’s souls that are parched with raging thirst. Which transforms those who drink from springs, and "rivers of living water shall flow from their bellies." And He said to the Samaritan woman: "The water that I shall give them will become in them a spring of water gushing up to eternal life." Which transformed the desert of the world into a paradise of evergreen trees planted by God, planted at the edge of the waters by the Holy Spirit. This productive theme has given rise to Church poetry and has embellished the feast of Mid-Pentecost with exceptional hymns. In short, this is the feast of Mid-Pentecost. Lack of a historical foundation has deprived it of the popular character which would have made it appealing to more people. And its entirely theoretical theme has not helped Christians without the requisite theological background to transcend the obvious and enter the festal glory of Christ the Teacher, the Wisdom and Word of God, the Source of unfailing water. What has happened to it is similar to that which happened to the wonderful churches dedicated to the Wisdom of God (Hagia Sophia), which, instead of commemorating Christ as the Wisdom of God, in Whose honor they were built, have ended up, for the same reasons, celebrating on the feast of Pentecost, or the Holy Spirit, or the Holy Trinity, or the Entry, or the Dormition of the Mother of God, or even the Martyr Sophia and her three daughters Faith, Hope and Love. From Λογική Λατρεία (Rational Worship), Ioannis M. Fountoulis, published by the Patriarchal Institute of Patristic Studies, pp. 108-14.